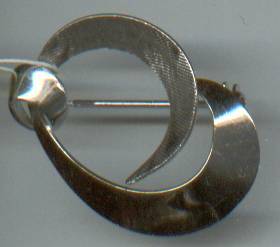 DuBarry Sterling: This little brooch was probably either award piece to it's representatives or as a premium for purchaseing their products. DuBarry products have been around for many years. I understand that they were sold through home parties like Sarah Coventry. The photo does not do it justice. It is a brighter silver than it appears. They each measure approx. 1 1/4"X1 1/4". Items Similar To "Brooch/Designer/DuBarry Sterling "